Maybe I’m old-fashioned or new-fashioned, I’m not sure, but I really don’t like to use an old (or new for that matter) outhouse to do my ‘business’ in. The comfortable, clean, odorless bathroom is my preference, even one at the gas station. We knew a young couple once, (way out in the country!) that used drywall buckets for toilets and used their waste to fertilize the garden, said it was the best way. I never ate with them. On the same vein of thought, I prefer to travel in an airplane, automobile, motorcycle or any other modern transportation device – vehicle. When it comes to local travel I prefer to get into the car and drive the 15 minutes to town than to ride a horse for an hour and a half maybe longer. When I return I just get out of the car and go into the house, without feeding, watering, brushing anyone or thing and all the other needs for the saddle care and mucking out the barn. Of course, many people LOVE all this and the pleasure of riding in the open air and they find true freedom and pleasure within their lifestyle. My hat’s off to them, and I do understand their viewpoint; I live & have my shop built on my 88 acres within the Hoosier National Forest in hilly Southern Indiana. It’s a great walk to work, no traffic. I never take that walk for granted, my love for the fresh air and 50-year-old forest surrounding me never lessens. Another pleasure for many and angst for me is sitting outside for hours in very cold weather waiting for the odd deer to wonder into my shooting zone. My mind tends to wander into my shop and to my lists of jobs sold, various chores I’ve put off, changing the oil in Mary’s car and on and on. In my thoughtful state a deer could tap me on the shoulder and I would jump up and run to the shop to work. But dear friends and thousands of others love the challenge and all the elements of hunting. Some of you might know where I’m going with this blog, but bear with me. Electricity in my home and shop is another preference I have. Flip a switch, and you get light, power, and a hot shower instantly, it’s great. There might be some who prefer to light their homes with kerosene, lanterns or candles, but I don’t personally know any outside my Amish neighbors. That life before electricity and back in the pre-civil war days was when the furniture in America was made exclusively with hand tools. Mostly it was also made with loving care and pride of craftsmanship and honor of their name. When they added their name to the finished piece it was with great pride because of the quality of workmanship. If the craftsmen of old were alive today, they would probably understand why many hobbyists, hand tool makers and advertisers, magazine writers, hand tool class teachers, etc. would promote the new fashion in woodworking of exclusive hand tool construction. It has a feeling of more control and personal touch and is deeply satisfying. But, also speculating here, these craftsmen from the past would probably enjoy the electric lights, saws, jointers, planers, sanders and on and on. No doubt the porcelain chair in the closet with running water and toilet paper would win their approval after a couple uses too. Please don’t misunderstand what I am saying here, I still use my hand tools, when it makes sense and there is available time. A couple classes back I was teaching two first time students. It was their first time in any woodworking class and their first project. Guess what? The electricity went off during a storm and there we were … two first time woodworking students and me. It was genuinely perfect for the occasion, we finished with hand tools only and they got more training than they expected. You see, it’s really about time. We all know in business time is money. Few of us can hand build furniture for just the sweet reward of doing it. 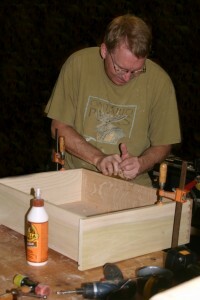 Most are in the woodworking business to do what we love and also pay the bills. That’s true now just as much as it was in the 1800 or 1700’s, really since the beginning of time. When you build custom kitchens, furniture, or anything out of wood for a living, at least when it’s your career, the method you support your family, put your kids through college, especially in fluctuating economies it’s best to be able to do an excellent job as fast as you can. But when time is not a factor you can do anything your heart desires, that is, if you have the money! The craft of woodworking has room for everyone. Some craftsmen only use Japanese methods, some hand tools only, some major in modern with the most fantastic machine available today and then there are those of us in the middle. The first time students in my class were happy that I was experienced enough to finish the class with hand tools only. But also happy that they took a class for a weekend and took home a completed piece of furniture. We could not have done that without electricity. It would have taken much longer than a weekend to finish the project without electricity and cost the student quite a bit more for the time involved. So don’t be intimidated if your friend or neighbor only works with machines to make his furniture. That’s their preference, you can master true craftsmanship with or without electricity. My personal preference is using electricity, as well as hand tools where needed so that I accomplish more in a short amount of time and bring in more revenue (to buy more wood!). The main rule for me is high quality either way. The total fulfillment in woodworking or any craft is that you can do it your way. I’m so thankful I was trained on hand tools and machines. If the electricity fails I can still make projects from wood, but maybe not enough to support myself! Once I retire and have time (I really cannot imagine that) but if I do I’ll probably still use both hand tools and machines. As new woodworkers, do not be intimidated by either method. Try both and more, try it all and enjoy the most fulfilling craft I have found and take it to any level you want and you can. Just make sure you are enjoying yourself and having fun. That is truly what this is about, self-fulfillment and sharing the projects you make with others. I had the opportunity to take Dale’s class building a Bow Arm Morris Chair. It was truly a lifetime experience. 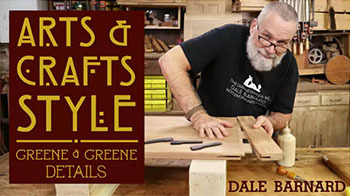 Dale’s knowledge and ability to teach what he has learned are amazing. The other student had never used a saw before and left with experience on all the tools/ machines and a beautiful chair. His attention to detail is refreshing. He has a desire to make sure you understand the particular lesson he is teaching/ showing that makes the cost a bargain ( plus you leave with a beautiful chair). There are only a few craftsmen left with his abilities and knowledge. The days were long hour wise, but really fun and enjoyable. I will be taking more classes in the future, probably the Greene and Greene table that is displayed along with some of his other pieces in the bungalow you can stay in. Thanks, Bill for the great comments, I couldn’t agree more! I really enjoy teaching what I have learned over the years and from your comments I am very glad you enjoyed the experience as well. I wish you well and look forward to our next encounter! Although I still am a student in woodworking I fully agree, as long as the result looks good and has good quality and (most important for me) you had fun making it, it doesn’t matter what type of tools you use. Sadly, the future is coming and with 3D printers and whatnot the ”common” woodworker rarely uses handtools… I can’t imagine myself working all day behind a stupid machine pressing random buttons, this is why I really like people who still use handtools (and even old fashioned machinery). As you mentioned though, it really is a fact of preferences, but I think the real woodworkers will never die out! Although reading this blog was an assignment from my english teacher, I really enjoyed reading it! My name is Steffie and I’m a student at the HMC in Rotterdam, the Netherlands. For an English assingment I have to comment on your blog. I really like the way you work, and I also agree with that way. Off course it is amazing if you can only work with hand tools but I also think that machines can help you to make things just a little bit easier and faster. In my first year of this school we had to make (cloth strips) that is literately translated into English so let me explain. It were two small massive planks with a layer of carpet were you could put a piece of work on without scratching it at the bottom. We had to raze those massive planks with only handtools no machines. Nobody understood why we had to do that since we had machines for that certain task. Our teacher than told us that if we for example made a chair and it was almost finished but you had to raze only a part of the leg of the chair, but you never learned those basics that you could damage all your work by not knowing one thing. That was I think a good lesson and also a good example of what you mean. It is good to read about your way of seeing things. The different perspectives of craftsmanship and the way of doing thing. The different ways of using machines, (hand and electric) and that is definitely something personal. Some prefer other ways to accomplish the same result or product. Great story, good to read and to see what your thoughts were about this subject. I am currently studying to become a woodworker in The Netherlands at. In our first year we use primarily hand tool so we gain the basic knowledge about woodworking. We also practised to make dovetails etc. I personally am like you but a bit more towards the machinery side. I enjoy working while using the old-fashioned techniques but I also think the machinery brings indeed a lot of speed. I also think it makes curtain actions, like sawing, easier. I hope that, when I receive my degree, I’ll be able to work just like you described. I a man student at the HMC (wood and furniture college) in Rotterdam. For my English assignement I have to comment on your blog. I think that you are right, it is your own choice if you use power tools or handtools. But it is always a good idea to learn everything hand tools, power tools, computer controled machines, etc. especially when it is your job. But on the other hand if you only do it in your free time. Then I think it is only needed to know about hand tools and power tools. The key to this proffesion is to have fun and work with care. That is my opinion. My name is Glenn Ederveen and I am a furniture making/ designing student from the Netherlands. Our teacher gave us the task to read your blog and reply to it. So be prepared to get alot replies this week. I hope this is not a problem for you. Many days I am day dreaming about the older days, and no not hunderd or twohunderd years ago but in the time of the kings and knights. And how they where able to make a lot of beautiful furniture without electricity and a CNC machine. But that’s not how it goes so we need to use all the handy and beautiful machines we can use. My name is Ronald van Wijk, I am 18 years old and I am living in Werkendam in the Netherlands. I’m following a study for furniture maker at the HMC in Rotterdam. And I am one of the students who have to look and command at your blog. I agree 100% with your opinion to mark something with “old” or “new”. I find it disrespectful. But I think the use of electric tools make your life so much easier. With our education you have to use both hand tools as electric tools because not every electric tool can do the same as you can do with your hands. And you need a bit of skill to. I am agree completely with your blog and I really liked reading it. I really liked reading your blog. I am learning to be a luthier at a woodworking school in the Netherlands. I totally agree with you on this matter. I have a passion for handtools, but some things are far better to do on machines. You can get more precision and at a greater rate on these woodworking machines. One of the scary parts about these machines, especially with musical instruments, is that it’s easier to make mistakes. I like the things you’re making and I agree on the method you’re doing so. You have got some great photo’s on this site. Keep teaching this wonderful craft and good luck with your business! After reading your blog I began thinking how I prefer to work. I agree, woodworking machines do work faster, but I am more into handcraft. I am bound to make mistakes because the machines are so fast. Mistakes that could have been avoided by working with hand tools. That is not the case for everyone, but for me it is. And on the other hand I really like the skill that goes into working by hand. All roads lead to Rome and that only gives the world colour. Really liked to hear you are a teacher in woodworking! My name is Dylan and I’m a furniture making student from the Netherlands. My English teacher gave us the assignment to comment on your blog, at first I didn’t really like the assignment since we already have a lot of home work. But it was actually really fun to read your blog, also, I agree with you when u say working with hand tools is deeply satisfying. But I think it’s a good time to be a furniture maker, I like that we can have best of both worlds now. The satisfaction of using hand tools and the speed of power tools. Anyways, it was nice reading your blog so thanks and good bye. My name is Jochem and I live in the Netherlands. I am studying to become a wood furniture maker at the HMC in Rotterdam. I think your right that hand tools and machines together the perfect mats is fore a good furniture maker. We learn at school the first half year working with hand tools and then a lot white machines. I like both, but hand tools you need feeling for it. My name is Anna and I am nineteen years old. I am a student at HMC in Rotterdam, I study Furniture maker. First of all, I couldn’t agree with you more about machines and hand tools. I also like to work with both and as a beginner furniture maker I really like the challenge to work sometimes with only hand tools and sometimes with only machines. Thanks for your funny blog, I really liked it! My name is Rosanne and I am also a student at the HMC in Rotterdam. I like working with hand tools as much as I like machine tools. Making wooden furniture is for me about creativity and realizing an idea in my head. I really liked your blog. I like your way of thinking about using hand tools and/or power tools. At school I’m learning to work with both methods. I prefer to work with hand tools but it takes much more time then when you work with power tools. Working with power tools is much easier but when the electricity is down you have no choice but working with hand tools. The choose of using hand tools or power tools is personal, I think. Thanks for the blog and keep up the good work. My name is Manon Christ and I am a student at the HMC in Rotterdam (the Netherlands). Our English teacher gave us an assignment, to read and comment you blog. I really liked reading your blog. I think that you are right, it is your own choice if you use power tools or handtools. My name is Perry van Dam and i am also a woodworking student from the HMC Rotterdam. I realy like your way of thinking, but honestly i am more a machinery man. But every woodworker has to know the basic knowledge of working with hand tools and how to use them in a proper way. My name is Tim van Alphen and just like the others I am also following a study at the HMC in the Netherlands to become a specialized woodworker and furniture designer and maker. I agree on your opinion that you should do whatever feels good but when you need to make money because making furniture is the main source of income then powertools do come in very handy. I still like to use both hand and electric powered tools because is you combine them you can make a great piece of furniture but in a shorter amount of time. I enjoyed reading you blog ! I loved to read your story and opinion of using electric tools (new) or hand tools (old), and I think it’s very important to can work with both of them. Just as you’ve said: the electricity went off during a storm. That’s one of the situations in which you must use your ‘old’ tools. But if you don’t know to work with that you have a serious problem. It’s good to read you have finished your work with hand tools and your students have had a good training! They should be very happy. I wish you good luck with upcoming work and I hope your electricity will work, because you work faster with machines and time is money. I really liked reading this blog, and I agree with you wholeheartedly. power tools are all fun and games until there is no power. I like to use power tools when I can, just because it’s quicker and easier. But sometimes i just don’t feel like using them and I use Handtools only. It’s better to have average knowledge on both sides than allot of knowledge of one side only. (that’s my opinion atleast) And when power is down you can continue your work, wich is always a plus. Thanks for commenting on my blog and glad you agree with my philosophies on power and hand tools. Hope you continue in your woodworking! My name is Rens and I’m a student at the HMC in Rotterdam, the Netherlands. For an English assingment we have to comment on your blog. I really like the way you work, and I agree with the way you work with hand tools. Offcourse it’s great if you can only work with hand tools and make furniture with that, but I also think that machines can help you to make things just easier and faster. You can also make more furniture faster because you already have the settings of the machine’s. Greetings from Rens de Kuyper. My name is Roy and I’m twenty years old. I am studying to become a wood furniture maker at the HMC in Rotterdam. I love it that you work with hand tools. You see it less and less. but with hand-made furniture I find so much more enjoyable. you have many more details of. and the fact that a piece of furniture is made by hand, makes it so much nicer. A lot of success in the future. My name is Rens and I am nineteen years old. I am a student at HMC in Rotterdam, I study Furniture maker and designing. I couldn’t agree with you more about machines and hand tools. I also like to work with both and as a furniture maker I really like to make furniture with both methodes, I have really enjoyed youre blog, I really liked it! I like to read your opinion about this question. In my opinion a furniture maker must do the job as fast and easy as possible. A CNC is such a nice piece of equipment if you know how to use it. The only thing you have to do is glue it together and done job. It makes the work done so much faster and a minimized fold possibility makes it for me much more interesting than doing it all by hand. This is my opinion about the question you are talking about. My name is Quinten van Dommelen, I’m also a student at het HMC in the Netherlands. Our English teacher gave us the assignment to read blogs and yours is one of them. I agree with you when u say working with hand tools is satisfying. You have to do your best to get it right. But with machines it is a lot faster of course. At school we first learned to with hand tools and later we could use the machines. I enjoyed your blog. I’m one of the students at HMC. If you like you can check our instagram: https://www.instagram.com/hmcmbovakschool/. We learn most of all about wood. New lessons are created to learn about new materials. I watched your video, the one with the glass. I hope one day i learn that too. If I could i would follow lessons by you. I’m not saying my school isn’t good enough, but you work most of the time with handtools. I read some of the other comments and most of the people are very keen about the lessons they had. Thank you, Phyllis, for sharing your Instagram information. I’m so busy I seldom have time to write the blog anymore. I do not have any full-time employees and work alone. As you can imagine it is very time intensive to do all the work required for the many clients I have at this time. My name is Dustin Franken. I’m 18 years old and for about two years student at the HMC in Rotterdam. I study Furniture maker and I really like to work with my hands. In the beginning I said that all the time. In the beginning it looks difficult to work with machines but if you know how work is it a piece off cake. I agree with you when u say working with hand tools is deeply satisfying. But I think it’s a good time to be a furniture maker, I like that we can have best of both worlds now. The satisfaction of using hand tools and the speed of power tools. It was nice to reading your blog! Hello Dustin, So good you are becoming a furniture maker! thank you for sharing your thoughts on the subject. When you’re in Holland don’t forget to visit our school HMC in Rotterdam!!!! My name is max and I am currently studying at the HMC to become a cabinetmaker. I totally agree with you. I really like to work with hand tools. I am always surprised about the craftsmanship in the middle ages and how they made the most beautiful furniture. But we are living nowadays and luckily we have electric hand tools and machinery so we can make everything a lot faster. Anyway, if you want to make money with woodworking your depending on electric hand tools and machinery. Whether you like it or not. Hi Max, Thanks for writing and sharing your opinion with me. I agree! My name is Mees Deppe and, surprise surprise, I’m also a student at the HMC in Rotterdam. Our English teacher, Mr. Sprakelaar, gave us the assignment to comment on a diversity of blogs. Which is why you’re receiving this much comments right now. I liked reading your blog because you used a nice metaphore to introduce your topic. I like using hand tools, but to be really honest I like using machines more. For me, machines are more precise and it works faster. I think they’re more precise because I’m not that trained with hand tools yet. Mees Deppe, Thanks for writing and sharing your opinion. Also thanks to Mr Sprakelaar. My name is Berend and I’m still a student, I’m following an education for furniture making in the Netherlands. hopefully I will become a skilled furniture maker one day. I really liked this blog you wrote, I like using hand tools instead of electric machinery. In this way I have more attention for the material, and all the fine details of the product. But I rarely use hand tools, its costs a lot of time and money which a lot of costumers don’t have. And why pay more for the same product when it can be done with electric machinery. It actually makes a lot of sense. But it’s a bummer the “real” craftsman’s are slowly dying out. Nowadays there is a new kind of craftsman, who knows how to program, control machinery, etc. Which is also a nice way of furniture making, but I really hope the “real” craftsman keeps on existing. My name is Joël van der Burgh, student at the HMC in Rotterdam. I like the way you think about modern techniques and the old ones. Their are both important for a crafstman. If the power goes out you can go on with your work and you can give a personal touch to your projects. On the other hand you have to earn a living and with power tools is that a lot easier. Hi Joel, Thanks for commenting on my blog. It’s good to know you read and appreciated my thoughts and beliefs. Best wishes to you on your studies at HMC! I’m student at the HMC (wood and furniture college) in Rotterdam and I’m 20 years old. I liked to read your blog and pictures from your work viewed. You make beautiful kitchens, I also allowed to make kitchens for internship. But that were mostly modern kitchens, I personally think less beautiful. The kitchens are mostly machine made, which is nice as long as you do not stand behind all day. Still, many handicraft remains sit in what I like. Even now I make a lamp made of wood with curved legs. where a lot of craft in it. I hope you like it that all of your blog posts. Hello to you! Sorry for the length of time it has taken me to reply to your comment. It sounds as if you are doing advanced work on your own with the lamp. In the craft of woodworking, even working at your own studio the kitchens you build will depend on the taste of your clients. I don’t always get to build my favorite style of projects. For me, I try to put all my attention on detail and pleasing the client. Developing your listening skills will help please the clients and make the relationship with them easier. Enter the meetings with a completely open mind and do not think of your own desires. Once the client shares the project they want to commission try to see it in your mind’s eye as they do. If they have pictures or you can draw it and you both understand what it is they need you to build it really helps make everything better. So focus on the details and I believe it develops you as a more experienced businessperson and craftsman. Someday I hope you can only build the furniture you love and provide the income you need to make your life happy. Best wishes on your education at HMC! I see more and more usage of computer controlled machines. We have a CNC in our school and it saves a lot of time. Also the machines get a lot more complicated. Machines work very precisely. Although even in the future I think we will still need hand tools to do certain things such as repairing old furniture. There are some tasks that machines cannot yet do such as creating round forms which a lathe could do but power tools make the work a lot easier. Jouri, Thank you for commenting and sharing about the machines at your school. I have never used computer controlled machines. My adult son now works in the IT networking field after he first studied computer drafting and design. Some of the machines you mentioned were at his school too. It completely amazes me and I feel quite sure I will never be able to use them. But like you, I believe they are necessary for the advancement of woodworking, just as hand tools will always be necessary. My name is Mik Witlox and I live in Roosendaal in The Netherlands. We have to do a project for our English lessons on the HMC in Rotterdam. We are preparing for the exams next year so that’s the reason why I write this. I like the thinks you are making. I’ts a good thing to learn everything about hand tools. Thanks for your funny blog, I really enjoyed it. Glad you liked the blog. I hope you do well on your exams and graduate with high marks at HMC. My name is Danielle de Ruijter I am 18 years old and is live in The Netherlands. I am also a student at the HMC in Rotterdam. I think you are right that hand tools and machines a perfect match is. But I also think that you can make beautiful furniture with hand tools. And it is a lot more fun. Thanks for the comment on my blog. Best of luck to you in our education at HMC. I’m glad to know you agree with the blog on hand and power tool use. I’m also thankful my dad taught me how to use both and I have been able to purchase 36″ wide belt sander among many other tools! My name is Berend and I’m following an education to become a furniture maker in the Netherlands. Personally I prefer to use hand tools instead of power tools, in this way I am more in touch with the material and I have more eye for all the small details. But I rarely use hand tools because it takes a lot of time and money, which a lot of customers aren’t paying for. It makes a lot of sense actually, why spend more money on the same product if it can be done for much less using machinery. Sadly, the “real” craftsman are slowly dying out. But there makes place for a new kind of craftsman who can program, use machinery, etc. which is also a nice way of furniture making. But I truly hope the “real” craftsman keeps existing. I am very grateful as well that I was taught how to use hand-tools to create various designs, although I tend to lean more towards power-tools for the big jobs, sawing, shaping, drilling and so forth. There has never been a project I’ve done where I haven’t at least once pulled out a hand tool though, it being either a block plane or a hammer at the very least! and of course all of the fine-tuning when it comes to sanding down and finishing a project. anyway, great stuff! I really like your outlook on things, and I’d love to some day take a look in your workshop. Waylon, Thanks for your comment. I agree. In many ways, it’s like using both your hands to work. I won’t tie my right hand behind my back because I’m left handed. So I won’t put away hand tools because I favor power tools, I need them both. Building custom furniture requires all the tools at our disposal in this modern world. Then we have more time for creativity. I wish you the best in your future and hope you become world famous! After seeing your sites and blogs I really want to make my own piece of furniture. You do an astonishing job. I like working with hand tools as much as with power tools and other machinery, but I am not as handy with hand tools as the other students in my class. So I practice with hand tools in my free time a lot. Furthermore, I often make sketches of furniture in my free time. For example, I made a sketch of a beautiful chair lately, which I hope to build in the future, manually of course. Someday, I hope to become as talented as you are. Best luck with your company. Hello Dale I am a student at the hmc Rotterdam and I’m learning to become a furniture maker. I really like your opionion on electric and hand tools. I work at a small furniture/interior builder and most of the time I am working with big machinery but when the power cuts out there is no way for most people to keep going because most of them have never been trained (Or trained themselves) to work with hand tools. Luckily I learned How to at school. Hi Hugo, I agree completely with your comment. It’s great your school has the foresight to teach the use of hand tools in a very technological world. Good Luck on your education as a craftsman! Next post: When Do I Finish a Project Prior to Assembly?